Tennis for Two: The World's First Video Game? Was "Tennis for Two" really the world's first video game? It hardly matters. 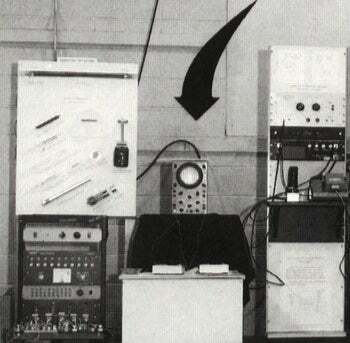 The distinction may belong to something called a "Cathode-Ray Tube Amusement Device" by Thomas Goldsmith and Estle Ray Mann that used eight vacuum tubes to make a tiny glowing speck of light appear to fire, missile-like, at tiny line-like targets. Players could tweak knobs to adjust for missile trajectory and velocity. 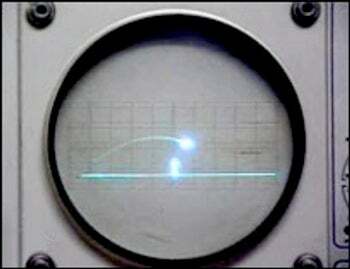 The patent for the game filed in early 1947 and issued in late 1948, but since it used an overlay to represent targets it wasn't capable of rendering graphically, it's usually singled out as the first interactive "electronic" (but not "video") game. Tennis for Two (played on that tiny device the arrow's pointing to in the pictures above) didn't arrive until a decade later, but it was a video game, and one developed over half a century ago. There were video games half a century ago? Not that you or I could buy or in most cases even play, but yes, crude though they were, these were the idiom's metaphorical microbes, rolling around in an analog idea soup of component resistors and capacitors. "Brookhaven Honors a Pioneer Video Game"